COMING SOON! Aug. 8, 2018: Early-bird deadline for NewsTrain workshop in Greenville, S.C.
Who is your diversity hero? Nominations needed by Friday, Aug. 3! “Diversity is a core value as important as upholding our First Amendment responsibilities as a free press,” Karen Magnuson, the executive editor of the Democrat and Chronicle in Rochester, NY, recently wrote. We are seeking nominations for individuals or news organizations whose actions and work reflect a strong commitment to diversity in honor of the late Robert G. McGruder, a former Detroit Free Press executive editor and former managing editor of The Plain Dealer in Cleveland. McGruder died of cancer in 2002 but spent his career championing diversity throughout our industry. Nominees should have made a significant contribution during one or more years to improving diversity both through retention and recruitment in their workplaces and also through news content. The Robert G. McGruder Award for Diversity Leadership is co-sponsored by The Associated Press Media Editors and the American Society of News Editors. This year’s winner will be announced during the annual APME-ASNE conference Sept. 11-12 in Austin, Texas. The winner receives $2,500 and a leadership trophy. Please consider nominating someone for this worthy honor by midnight, Aug. 3, 2018. The 2018 ASNE-APME News Leadership Conference kicks off in less than six weeks! For two full days at the AT&T Executive Education and Conference Center, we'll address the latest innovations in content and technology, leadership strategies, new business models and more. Check out the schedule and sign up now to join us Sept. 11-12! Book your hotel room NOW if you plan to attend the conference. Our $219 nightly rate in the ASNE-APME room block will not be available after Aug. 9. Currently, our block is sold out for the night of Sept. 12, though there are still rooms available at the hotel outside of our block. If your reservation includes the night of Sept. 12, then the online registration system won't let you reserve a room. Instead, please call 512-404-1900 and reference the program name "ASNE-APME" to book any stays that include the night of Sept. 12. Lunches ($80 value) will be on us if you're selected as one of two winners who registers for the conference and books at least two nights of hotel between July 31 and Aug. 9. During the lunch on Sept. 11, we'll hear from A.G. Sulzberger who became the Times' publisher at the age of 37. As publisher, he is focused on safeguarding The Times' longstanding commitment to excellence and editorial independence "while embracing the imperative to adapt to a changing world." Sulzberger has long been a change agent inside the building. He was an architect of The Times' digital transformation and the principal author of the 2014 Innovation Report, which focused on growing and engaging its digital audience. He has also been one of the driving forces behind the company's business strategy, including the shift to a subscription-first model. Today, The New York Times has the largest digital pay model for journalism in the world, with more than 3.5 million paid print and digital subscriptions. The following day, we'll have a conversation and a Q&A with Chrissy Towle, head of Google Local News Initiatives. Towle manages the News & Local Media team working with the largest publishing partners in the U.S. Her team facilitates and strategizes with those partners to ensure optimal use of Google products to drive maximum revenue and profitability. One of the most sacred beliefs for news organizations is that we do not take down published articles or photos. But editors are having to balance that belief with the knowledge that even the most trivial crime brief, although factually correct, can have a devastating effect on someone's life 10 years later. Editors are fielding an increasing number of appeals from the subjects of these stories who argue that the photos should be removed or the articles should at least be updated with the resolution to the case. What should you do? When should we order up more reporting? Should a story ever come down? This session is sponsored by the Austin American-Statesman and GateHouse Media. What are the key technological tools that you can implement to make your newsroom more effective and efficient? Are you using the right ones? ASNE and APME have whittled down the list of competing companies and have invited the best ones to Austin to explain why other newsrooms have hired them and why you should, too. Editors will have the opportunity to ask questions about the product. You will leave with a far greater understanding of how technology can make you a better editor. Wrap up your ASNE-APME conference experience on the night of Sept. 12 by attending a free porch party that GateHouse Media, the Austin American-Statesman and ONA Local Austin are hosting as part of ONA18, which kicks off Sept. 13. They're brewing up a Texas-flavored music-and-mingle on the Statesman's back porch, a long stretch overlooking Lady Bird Lake and the Austin skyline. Join the party just a three-block stroll from the JW Marriott (the official ONA conference hotel), through prime bat bridge viewing, where you'll be greeted with a friendly Texas howdy, local food, drinks and tunes. Registration details coming soon. The 2018 ASNE-APME News Leadership Conference kicks off in less than seven weeks! For two full days at the AT&T Executive Education and Conference Center, we'll address the latest innovations in content and technology, leadership strategies, new business models and more. Check out the schedule and sign up now to join us Sept. 11-12! The registration fee is $275 for members of ASNE and APME and $375 for nonmembers. Lunch tickets are $40 a piece and can be purchased when you register or separately through the online store. Reservations must be made by Thursday, Aug. 9 (no extension after this date). A terrific group rate is available at the on-site hotel at the AT&T Executive Education and Conference Center for $219/night Sunday, Sept. 9, through Tuesday, Sept. 11. Make a reservation online. Our room block is sold out for the night of Sept. 12. However, there are currently still rooms available at the hotel for the night of Sept. 12 outside of the ASNE-APME block. If your reservation includes the night of Sept. 12, then the online registration system won't let you reserve a room. Instead, please call 512-404-1900 and reference the program name "ASNE-APME" to book any stays that include the night of Sept. 12. Five diversity scholarships available: Apply by midnight Friday! The early-bird rate of just $75 is good until Aug. 7; the rate increases to $85 on Aug. 8. The first 20 to sign up receive a free AP Stylebook (a $22.95 value). There are five diversity scholarships funded by the APME Foundation for the workshop. Apply to be a Greenville diversity scholar at http://bit.ly/2MjKPPH by Friday, July 27. • Identify accurate content and debunk hoaxes. • Use social media for sourcing, spotting news trends and verifying user-generated content. • Turn your smartphone into a versatile, multimedia reporting tool in the field. • Better manage your time and that of your newsroom teams. On the hunt for a workshop in DFW to discover new digital skills? Diversity scholarships available; apply soon! Denton NewsTrain will offer a full day of digital training on Sept. 22, 2018, at the Mayborn School of Journalism at the University of North Texas in the University Union, room 333, 1155 Union Circle. It is 41 miles north of Dallas and 38 miles north of Fort Worth. Early-bird registration is $75 through Aug. 22; the rate increases to $85 on Aug. 23. Sign up soon for the best rate and a chance to receive an AP Stylebook (a $22.95 value). There are five diversity scholarships funded by the APME Foundation for the workshop. Apply to be a Denton diversity scholar at http://bit.ly/2HNjou2 by Aug. 10. The Associated Press Media Editors is looking for emerging-career editors who would benefit from a year of one-on-one mentoring from an editor more established in his or her career. Ten emerging newsroom leaders will be selected to participate in the first year of this program. Those chosen will be paired with veteran editors whose expertise best matches the career goals of the applicant. If that sounds like you, or someone you know, please complete/share this application. 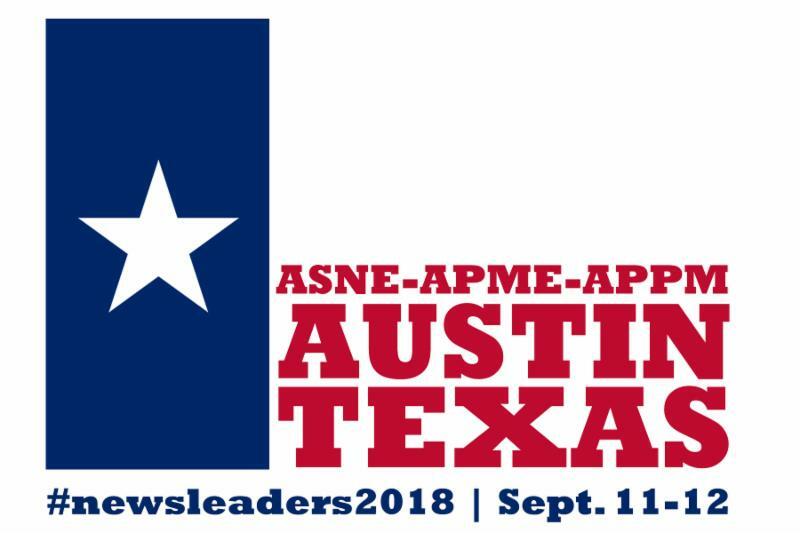 This is a one-year program with selections announced by email in August and a first meeting of mentor/mentee in September (in person, if possible, at the ASNE-ASNE News Leadership Conference in Austin, Texas). USA Today: Hospitals know how to protect mothers. They just aren’t doing it. Seattle Times: He’s Mexican. She’s American. Deportation forced this Washington state family to make a choice. Dallas Morning News: Atmos' gas leaks go far beyond one northwest Dallas neighborhood. See how bad the problem is. Columbus Dispatch: Was CVS favored by state in multimillion-dollar deal to provide HIV drugs? NJ.com: They scammed consumers. Some owe millions. Why can't the state get them to pay? St. Louis Post-Dispatch: What did we learn from the Great Flood of '93? Not much, say many. The Des Moines Register: Before the fatal crash: What happened the night Benjamin Beary went drinking at The Keg Stand? Montgomery Advertiser: Wastewater treatment is a problem in the rural South. Who is working to fix it? Have journalism news you can share? Send current links and any preamble here and we'll share them with journalists, each week. Thanks for participating. OGDEN, Utah (AP) — The Standard-Examiner newspaper in Ogden has named a new executive editor to oversee its newsroom in addition to her current post directing the Daily Herald in Provo. The Standard-Examiner reported Jordan Carroll's new role Friday, two months after it was sold to the Provo newspaper's West Virginia-based parent company. Twenty-one people were laid off at the Standard-Examiner, including five in the newsroom. Carroll acknowledges the transition has been "bumpy," but said good changes are coming and asked readers for patience. Carroll is a Texas native who graduated from Brigham Young University and has worked for the Daily Herald for six years, three of them in the top newsroom position. Publisher Rhett Long says she is "young in age, but really old in wisdom," and he appreciates that she will challenge him on tough decisions. TOLEDO, Ohio (AP) — Block Communications Inc. has promoted Kurt Franck to vice president of newspaper operations. He will oversee the company's papers in Pittsburgh and Toledo. Allan Block, chairman of Block Communications, announced that Franck will remain based in Toledo while also overseeing the Pittsburgh Post-Gazette. Franck earlier this year took on the role of president and general manager of business operations of The Blade in Toledo. Franck joined The Blade in 2000 as managing editor and became executive editor in 2009. He also has worked at the Sun Sentinel in Florida and with United Press International.